Recently I received a message in morse code from a family member using this site. It said that the sender had hidden the message, so I was presented with 2 options: I could sit and decode the message by listening to it over and over again, or write a program to do it for me. Naturally, as a computer science student and enthusiast, I chose the second option. 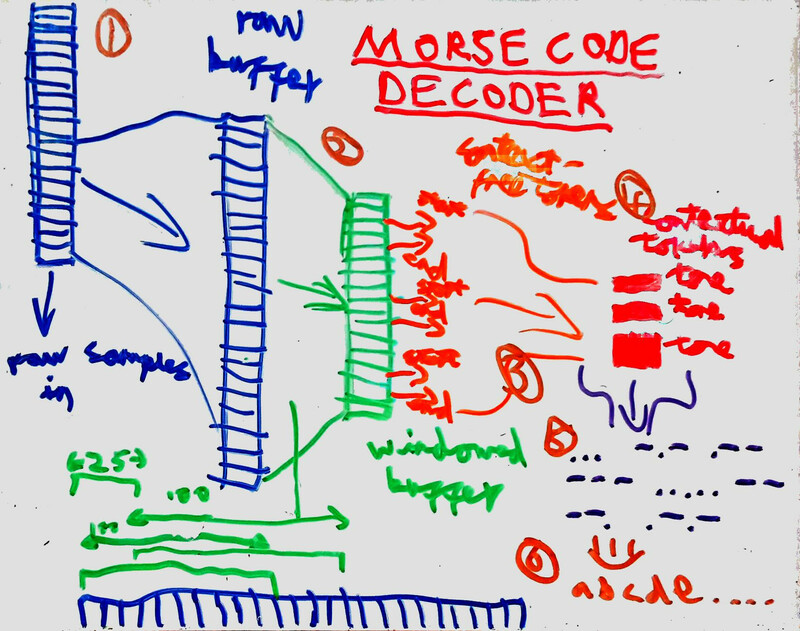 My first problem: Capture a recording of the target morse code. This was easy - the audio-recorder package in the ubuntu repositories solved that one easily, as it has an option to record the audio output of my laptop. Second problem: Figure out how to read the recording in and extract the samples in C&sharp;. This one wasn't so easy. Amidst issues with flatpak and Monodevelop (flatpak is terrible! ), I eventually found the NAudio (Codeplex, GitHub, NuGet) package to do the job. After some digging, I discovered that NAudio is actually really powerful! It's got some pretty advanced functions for handling audio that I'll have to explore at a later date. /// A simple class to translate a morse code string into a normal string. /// rather than accessing this lookup table directly! /// Translates a single letter from morse code. /// Translates a string of space-separated morse code strings from morse code. /// Translates a list of morse-encoded words. Read the raw samples into a buffer. If there isn't enough space to hold it all at once, then we handle it in chunks. Move a sliding-window along the raw buffer, with a width of 100 samples and sliding along 25 samples at a time. Extracts the maximum value from the window each time and places it in the windowed buffer. Analyse the windowed buffer and extract context-free tokens that mark the start or end of a tone. Convert the context-free tokens into ones that hold the starting point and length of the tones. Having drawn up an algorithm and 6 steps I needed to follow to create the program, I spent a happy afternoon writing some C&sharp;. While the remainder of the algorithm is not too long (only ~202 lines), it's a bit too long to explain bit by bit here. I have uploaded the full program to a repository on my personal git server, which you can find here: sbrl/AudioMorseDecoder. If you're confused about any part of it, ask away in the comments below! Binaries available on request. I'll leave you with a pair of challenging messages of my own to decode. Try not to use my decoder - write your own!